ATLANTA, Georgia (CNN) -- In a small independently owned coffee shop on the corner of one of Atlanta's urban pockets, a group of would-be poets come together at open mic night for an evening of poetry and rhymes. 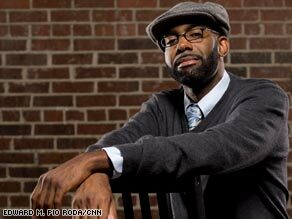 Emmy-nominated spoken-word poet Jon Goode appears in CNN's "Black in America" series. It's one of the monthly gatherings at Urban Grind coffeehouse that has lured talent as spoken word emerges from the underground. Artists such as Tommy Bottoms, Goldie, Chas, Nukola and TheresaThaSongbird take turns at the microphone testing their poetic skills. These bohemians of varying talent coin rhymes about subjects ranging from AIDS and prostitution, to high gas prices and the pangs of unrequited love. But it was the emcee who got the most props that night. "Kids will be kids but moms will be moms, you can did what you did and mom's gonna show you right from wrong. That's how my mom used to do." CNN's Soledad O'Brien examines the successes, struggles and complex issues faced by black men in America -- 40 years after the death of Rev. Martin Luther King Jr.
Friends liken him to "a civil rights leader that listens to rap music." Goode's spoken-word performances are drawn from a collection of personal stories, most of which are true, he says. The seasoned wordsmith rose through the ranks to deliver his rhymes to the spoken-word mainstream. He's done writing stints and made appearances for Nike, Nickelodeon and CNN's "Black in America." But it was after an appearance on HBO's "Def Poetry Jam" that Goode really started to get noticed. Goode says the trek to renown was not easy. For several years, he sent the same demo tape to HBO, hoping to get picked up on "Def Poetry Jam." They told him he needed to be more animated, theatrical. It was not until he filled in on a radio show that he was noticed by an HBO executive, who asked Goode for another tape. Goode passed along the same one he had been sending for the past four years. Tthe HBO executive "took it home and said, 'that was dope,' " Goode recalled. One writing gig led to another, and Goode was able to quit his corporate job and make a living from poetry. In 2006, he received an Emmy nomination for a skit written for the Nick@Nite Black History month campaign. iReport.com: What did you think about Black in America? Born of the smoke-infused speakeasies of 1950s and '60s underground San Francisco, California, the art of spoken word was popularized by beatnik writers such as Jack Kerouac. And music critics have called the Last Poets -- political black poets and musicians who rose from the 1960s civil rights movement -- an early influence on hip-hop music. In recent years, spoken word has evolved into a byproduct of rap music adopted by the urban community. Hip-hop mogul Russell Simmons popularized spoken word with his "Def Poetry Jam" series on HBO, drawing special performances from big-name celebrities such as Dave Chappelle, Alicia Keyes and Kanye West. Educator and hip-hop linguist Michael Eric Dyson, who also performed on "Def Poetry Jam," says spoken word has given an intellectual voice to urban culture and poetry a new accessibility to an American audience. "The revival of oral magic in black culture over the 25 years with the popularity of hip-hop has sparked the renaissance of spoken word and given it a new platform in black America," Dyson said. "Usually it's more political and culturally conscientious than the hip-hop that is currently invoked," he said. Goode agrees that spoken word is hip-hop in its most stripped-down form and a pill that's easier to swallow when it comes to appreciating poetry. "I like spoken word because it only requires you and your voice. "Hip-hop artists need all these beats and all this production," he said. But Goode is quick to remind aspiring poets that success does not happen overnight. He encourages writers to "have a plan" before they quit their day jobs. It's a message he passes along to the young people he meets when he's on tour performing at black colleges or mentoring elementary school children. "I try to speak to young people ... and try to get them to move forward," Goode said. "They never knew they could be a writer; they thought they have to be a rapper or sell dope. "I try to tell the kids that you can get to where you want to be just by being you. It may take you a little longer, if you believe in yourself and what you do, just stick to your guns, and you'll get to where you are going."